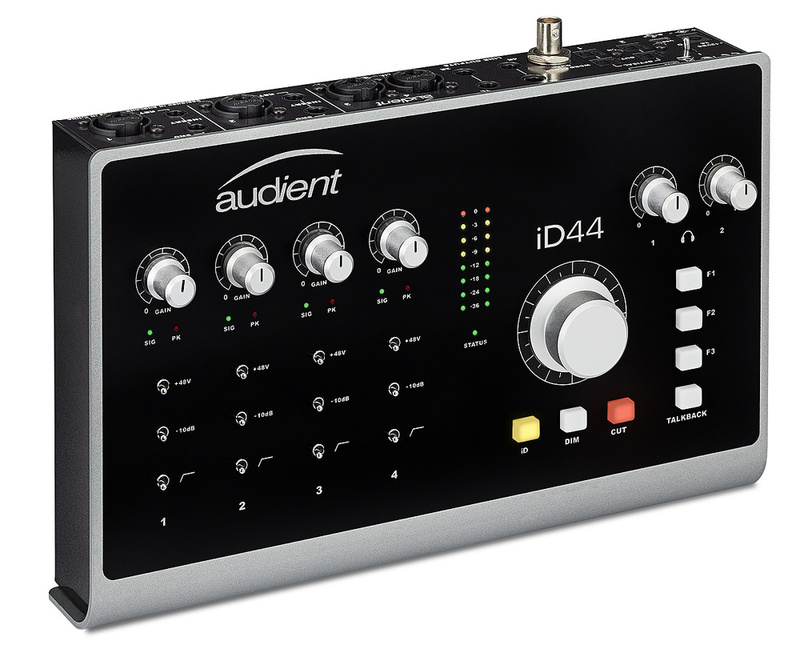 The iD44 is a versatile desktop interface with Audient's trademark audio quality. Audient's iD range of desktop USB audio interfaces was launched in 2013 with the arrival of the iD22. The more compact iD14 arrived in 2014, and 2016 brought the even more compact iD4. Now Audient have reversed this shrinking strategy with the release of the iD44, a 20-in/24-out, 24‑bit/96kHz, USB 2.0 audio interface which, with its companion iD Mixer DSP application, runs on both Mac (OS 10.7.5 onwards) and Windows (7 and later) computers. Although somewhat larger, the iD44 retains its siblings' chunky black and silver metal casing, custom aluminium knobs, illuminated push-buttons, large rotary encoder, single stereo LED meter and horizontally-oriented microswitches. Its four mic/line analogue input channels — all of which feature Audient's classic, all-discrete, Class‑A microphone preamplifier — appear on Neutrik XLR/TRS combination connectors and, on the digital side, two pairs of optical inputs and outputs can be configured independently to provide additional inputs and outputs in either ADAT or S/PDIF formats. An incongruously bulky BNC word‑clock output connector provides synchronisation for external digital hardware. Four of the iD44's eight analogue outputs appear on line-level, electronically-balanced TRS jacks that are set up as two L‑R pairs, 1+2 and 3+4. The others (5+6 and 7+8) are routed to the two headphone outputs at the front of the unit.